Jeremy and I sat at the rocky edge of a familiar alpine lake last summer. These special places that we visit regularly hold memories that are awakened when we arrive. It’s like greeting an old friend. I stood up on a boulder in the breeze as my eyes scanned the beautiful surrounds. After a while Jeremy asked what was on my mind. “I don’t think Kaweah will ever be able to come up and swim in her favorite lakes again.” My voice broke and I had to whisper the last few words. Kaweah loves being outside. She was a complete nut in the mountains for well over a decade, always straining to walk ahead no matter how tired she was, sniffing marmots and pika on the wind like it was crack cocaine. And then there were those running leaps into half frozen mountain lakes, taking several crazed laps around the water, tear-assing around on shore, soaking wet and chuffing with excitement. She lived for her hikes and swims. Kaweah spends much of her time indoors now, except for her potty breaks. We make an effort to give her “Kaweah time” either in the yard or on the deck where she can sniff the latest news in the neighborhood. Her legs are so weak that walks are pretty much out of the question. So the other day, after scoping out the Slate River on one of our trail runs, I sat with Kaweah in the backseat of the car as Jeremy chauffeured us to a trailhead. 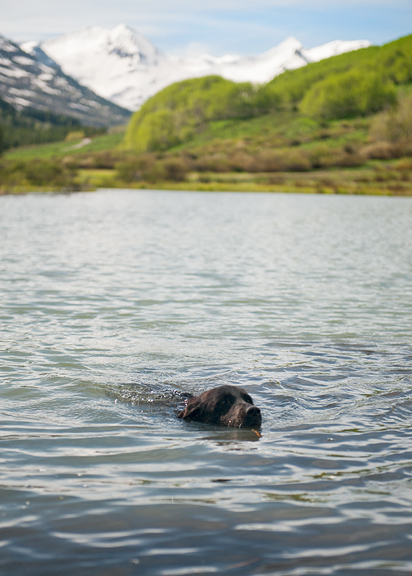 All of the rivers in Crested Butte are moving fast and full with the spring runoff, but there are always side ponds (mostly beaver ponds) with currents gentle enough for an old girl like Kaweah. Jeremy carried her out into the water. We weren’t sure if Kaweah would hate it or love it. It’s hard to read her sometimes, but she seemed to enjoy the swimming and the mobility – being free of her feeble hind legs. She took a few laps before getting pretty tired, at which point she swam to shore where Jeremy picked her up and we toweled her off and plied her with lots of loud praise (she’s mostly deaf) and treats. It’s a mere shadow of her glory days, but it seemed to be the highlight of her week. Kaweah was completely tuckered out for the rest of the day and part of the next day. We’re not planning to make it a daily routine. We want to make her happy, not kill her. Luckily for her, we are running the grill a lot more with the warmer weather – and THAT makes her VERY happy. I sometimes think I catch her staring at the grill longingly, or perhaps it’s the rack of ribs cooking inside the grill? 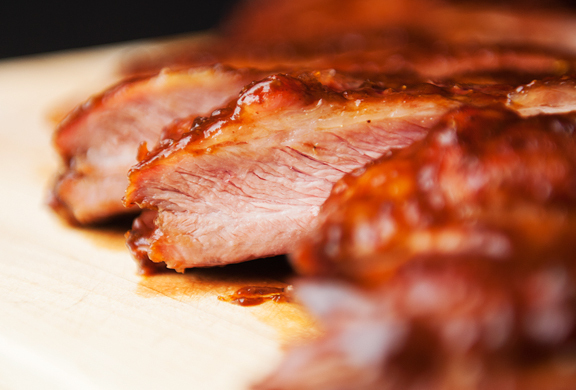 Who doesn’t love summertime ribs? It’s one of those dishes meant to be shared and eaten in good company. What drew me to this recipe was the Chinese twist on the rub and the marinade/glaze. Chinese five spice, hoisin sauce, oyster sauce… sounded good. Very good. I cobbled together a recipe from a couple of recipes, plus I added a “steaming” step to make the ribs a little more tender. 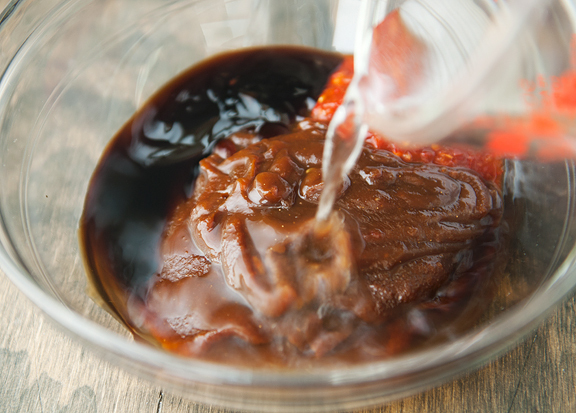 It takes time (marinating, grilling), but it’s not terribly complicated at all. 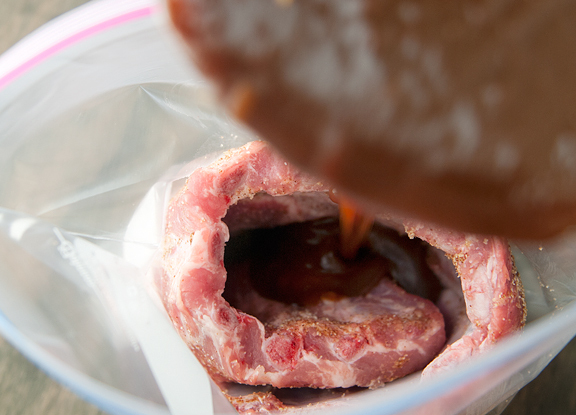 I really like to use ziploc bags for marinating meat. You can moosh them around and handle the meat without getting it all over your hands, it takes up less space in the refrigerator, and it’s easy cleanup. 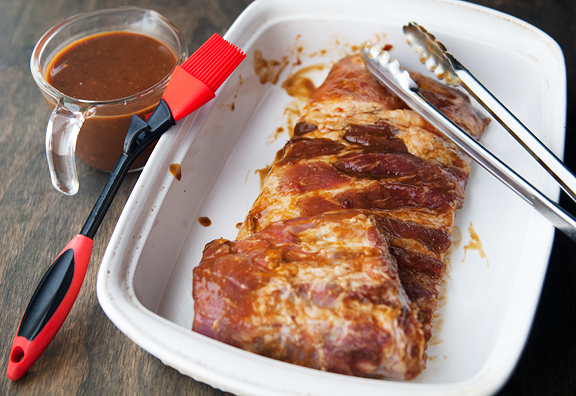 A rack of ribs is generally too large to fit in a ziploc bag, unless you fold them up (why not?) in thirds and tuck them into the bag. Just be sure to squish the marinade around to cover all of the rack. 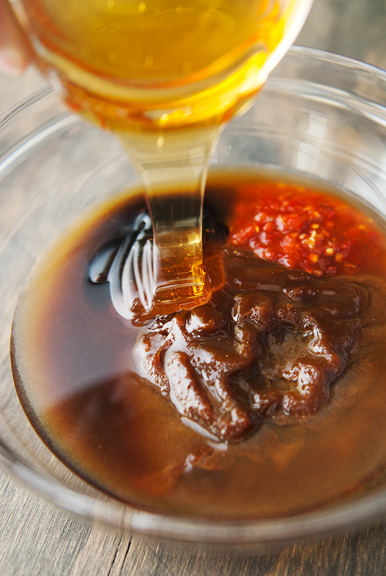 When you are done marinating, remove the rack and reserve the marinade for glazing. Indirect heat in grilling just means that the coals are shoved to one side of your grill or you have one of your burners off and the meat is on the “cool” side. The next step after the initial 30 minutes of grilling is to enclose the ribs in a leak-proof foil pouch with a half cup of apple juice. Set this on the grill (indirect heat, once again) for another 30 minutes. This helps steam the meat and make it more tender. The last step is to remove the ribs from the apple juice steam pouch and set it on the grill (indirect heat, but higher temperature). Baste the ribs with the reserved marinade. Because that marinade had raw pork in it, I’d make sure to give the last glaze a good 10 minutes to set. If you plan to serve the glaze on the side with the ribs, either make a fresh batch or simmer the marinade on the stove until it is bubbling. These are not falling-off-the-bone tender ribs (my favorite kind), but they are awfully tasty. 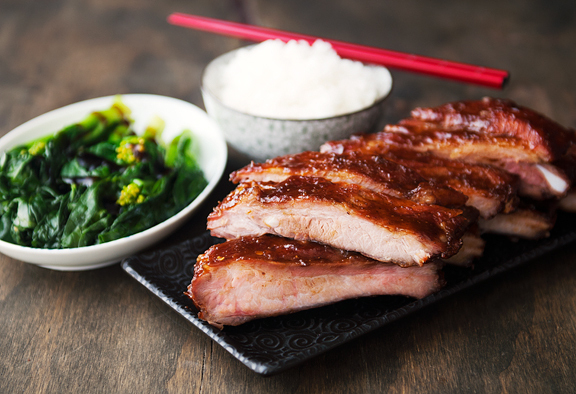 The ribs have a good meaty bite with hints of that Chinese five spice peeking through the sweet and savory sticky glaze. 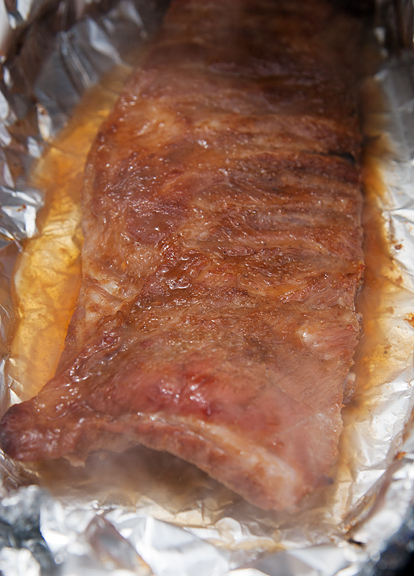 It’s no wonder that Kaweah was trying her best to follow us between the grill and the kitchen when we made these ribs. The girl has a nose for what’s good. 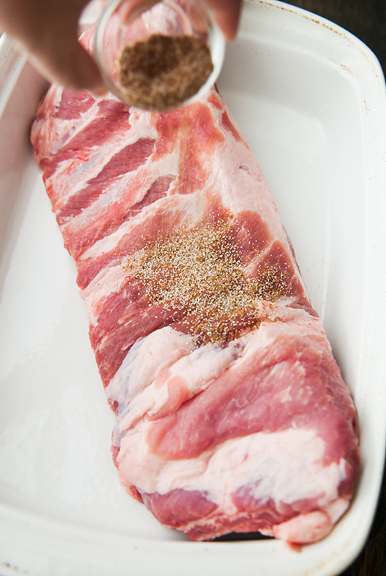 When ready to grill, remove the rack from the marinade and reserve the marinade for basting. Heat your coals or grill to 300°F with the coals pushed to one half of the grill or one of your burners turned off. Place the ribs on the side of the grill with indirect heat (NOT over the flame or coals), bone-side down for 30 minutes with the lid closed. 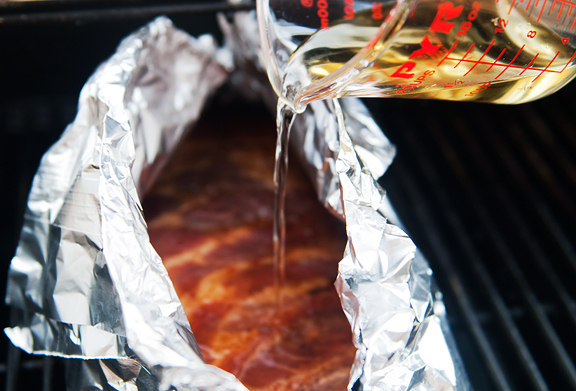 Meanwhile, make a leak-proof foil pouch large enough to seal the rack of ribs. 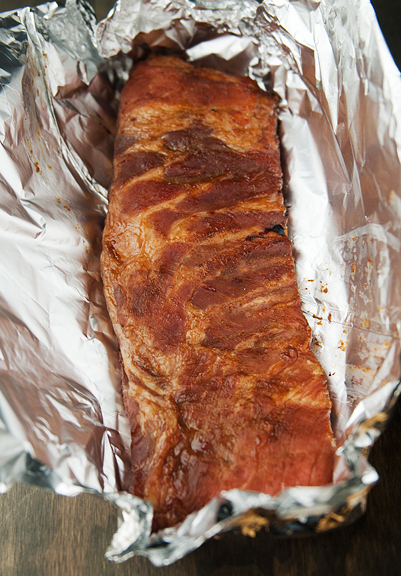 When the ribs have grilled for 30 minutes, place the rack in the foil pouch. Set the foil pouch back on the grill on the indirect heat side, pour the apple juice into the foil pouch, and seal the foil pouch tightly. Close the lid and grill for 30 minutes at 375°F. Unwrap the ribs from the foil packet and set the ribs on the grill (still on the indirect heat side). Reduce the temperature to 250°F. Baste the ribs with the marinade. Close the lid and let cook for 5 minutes. 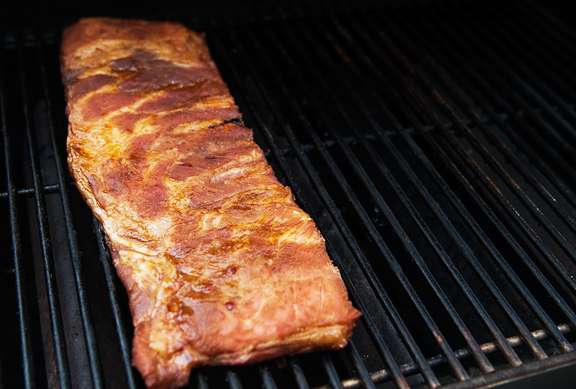 Flip the ribs over, baste, and cook for 5 minutes. Continue doing this until the ribs have cooked for 30 minutes. 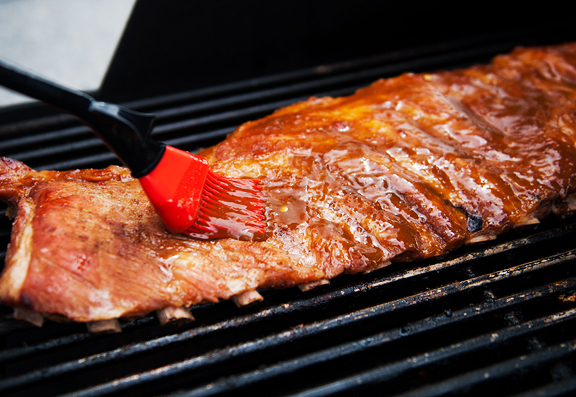 Make sure the ribs cook for at least 5-10 minutes after the last basting. Remove from grill, slice into individual ribs, serve. I came across this blog years ago- 2007, perhaps? I came for the food, but stayed for Kaweah. I know that the joy that she brings me every time I see her cute little face is merely a fraction of the love you feel for her, but I just wanted to thank you for sharing her with your readers. Sending her internet ear scratches, from an internet fan. Oh, that made me cry. So sweet. Love the way your personality shines through in your posts, and your Kaweah stories and all that you guys do to enrich her life are a big part of that. Thank you so much for making us all a part of your lives. Jen, I’ve known it for yours through reading your blog, but you and Jeremy are excellent parents to Kaweah. I loved the photos of her swimming. Kaweah Kaweah might be the luckiest dog in the world. Even if her life is fading, you know she’s had a very happy one and you and Jeremy couldn’t love her more – and believe me, she knows! Such a sweet story. Brought tears to my eyes too. You guys clearly love Kaweah, and I know it is sad to see her health declining. Very sweet of you to take her out for a little swim! I’m sure it was emotionally draining but it looks like she loved it. And also thanks for the recipe – bonus! Printed it! Looks great. What a happy girl in that pond! I bet being in that water was freeing for her. 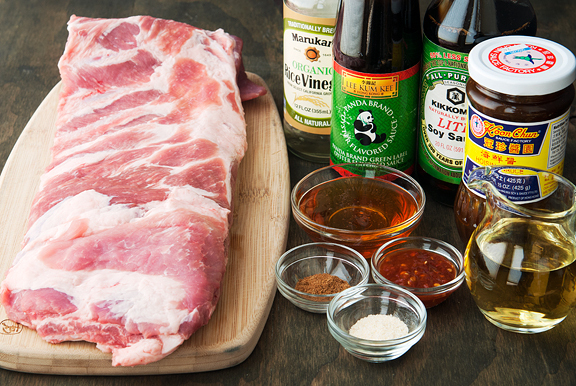 And a great recipe–I like to grill pork ribs at least once a summer, but our go to dry rub is getting old. This sounds like the way to switch it up! Count me among the many Kaweah fans, I’ve been tearing up every time you talk about her lately (but don’t stop, I love to read about her!). It’s great that you were able to take her out for a swim, I’m sure she loved it. 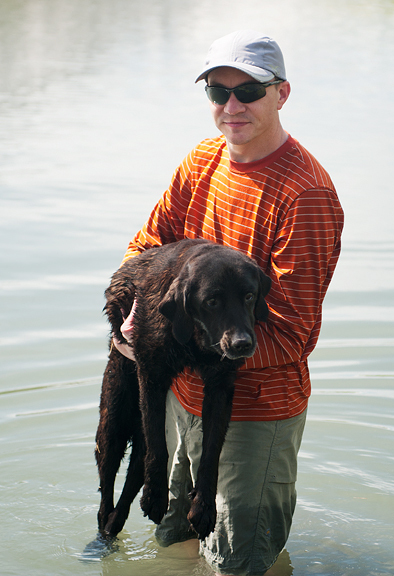 You understandably might not want to invest in one if you don’t think you’ll be making many more trips to the water, but the make doggie lifejackets that might be helpful for Kaweah as she swims. 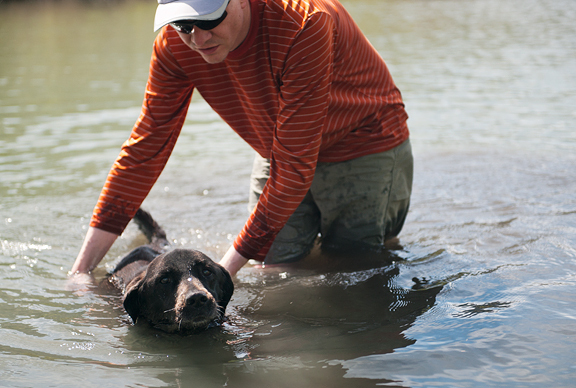 We have some for our dogs and it definitely helps them to enjoy the water for a bit longer when we go for a swim. Give her a nice scratch behind the ears for all of us fans! You guys are such good parents to Kaweah. She is so lucky to have you! This melted my heart. I had an old lab that we treated the same way–we adored her and did all we could for her, and she gave us 15 great years. Enjoy your time with your girl. If there is such a thing as “coming back,” I want to come back as your dog. Lucky girl. who I had to have put down due to lymphoma 6 yrs. ago, and remembering her when you talk about your Kaweah, I still miss her! Yeah I’m crying, too. She is so lucky to have you guys. First I have to say I Love your food style and prep – this one will go in my collection of yummy things to make and eat. I also really admire your dedication to Kaweah. I have always had my fur family ( my eldest is my Phoenix cat who is 25 years old but still the boss) so I somewhat understand what you are going through with her. Her eyes show her enjoyment in the water. Thank You and Bless You guys for being so Loving and dedicated to her. Sweet Kaweah….she knows she is loved. Kaweah is such beautiful pup!! The love between dogs and humans is a blessing. Sending you and Kaweah lots of love! Not much to say. Great people always have great dogs. Or is it great dogs always have great people? Enjoy. And the ribs are awesome! It’s so lovely to see how much you guys love Kaweah and care for her. Thanks for the rib inspiration too. I really wish I had a grill! Blast you, New York City living. I love you and your love for Kaweah. Yep, me too. Aww, you’re the best doggie parents in the world. Sending lots of love! My eyes are tearing. I love the pics of Kaweah and look forward to reading about her. I am such a sucker for animals and Kaweah is so lucky to have you both. If I were a dog, I would want to be your dog. I’ve said it for years, but you guys are amazing. You could teach so many of us to be better parents to our biological and our furry kids. I really love you three! And the dang captcha is even harder to see through teary eyes. Dogs teach us so much. Kaweah is beautiful and blessed to live with such caring people. Elderly pets are especially sweet, I know from my experience with a cat who became deaf in his later years. Alana says it. There are no words I can type that can adequately express the admiration and love I feel for you Jenzie. We’ve never met, but you have shared your world AND your sweet Kaweah. All of us are better for having ‘found’ your blog, and it goes without saying, but must be said, “We are here for you.” Your love for Miss K has warmed us and given us the gift of hope. ^^^ …Yep, what they all said. Alana said it first, and for those of us who have followed you all for years now, it’s been our privilege to have this sweet peek (or should I say peak?) into your lives. And it’s obvious your sweet Kaweah has captured our hearts… we be dog people. We smile, we cry, we know this is not an easy time, we are with you. And you continue to provide her (and us) reasons to celebrate. (and PS… we’re better cooks too. You’re great at what you do! ;) Big fat hugs. Sarah – awww, don’t cry. She’s still with us for now. cherie – she has definitely made our lives richer. Brianne - ha, I think we need to try a dry rub to see which we prefer. Camille - thank you for the tip. It's doubtful she'll get more than a couple (or even one) more swims before her time is up, so I think we will pass on the life jacket - but what a great thing to know about! hungry dog - thank you, we are doing our best! Melissa - love you, girl! Genna S - clearly, your fur babies are very lucky to have you. 25 is really impressive for a kitty! Cath - so sweet, thanks for the love. Abbe - not sure how the saying goes, but we definitely lucked out. 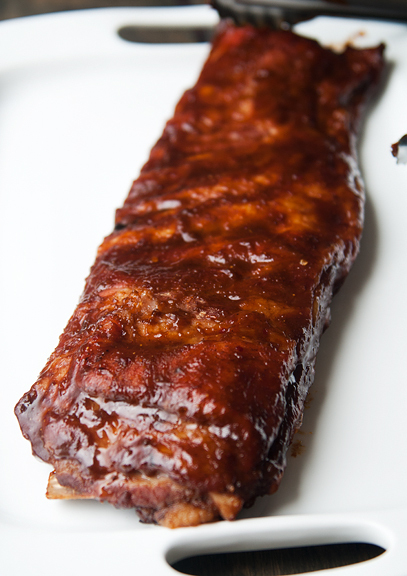 Kate - you can definitely make tasty ribs in the oven! One of the recipes I referenced does just that (I adapted it for the grill). debbie - you're very sweet - thank you. Kristin - awwww, you're such a dear. Thank you, hon. So cool that you took Kaweah for a swim. My ex-husband has an elderly dog. Their twice daily walks are at a much slower pace and on much flatter terrain than they used to be. I think it’s so important to nourish their minds particularly when their bodies won’t let them get out and experience all that they used to experience. Giving Kaweah the chance to stretch her legs and see some new sights was probably very nourishing to her. Probably nourishing for you as well getting to see her enjoy her swim.